I was very fortunate to have my brother visit over the holidays – what an awesome few weeks. In the meantime, protesters and 9wu shoppers continued to fill the streets in Kowloon at night, and a Christmas concert was held at CUHK and the three former protest sites as well. The usual new year’s countdown at Times Square was cancelled – not officially because of the protests, but definitely influenced by them – though as far as I recall, that didn’t stop the Umbrella Movement from having their own celebrations. The Chinese University of Hong Kong has estimated that some 1.2 million people took part in the demonstrations – a massive number, for a city with a population of 7.2 million – about a sixth of the entire population. The police did not charge the Three Sons when they surrendered themselves on December 3, and it was only on January 9 that the police gave them the dates between which they would be arrested. The Three Sons will be called to the Wan Chai police station between January 22 and 24, while Apple Daily‘s Jimmy Lai is due to the station on January 21. After the disastrous attempt to escalate the movement on the night of November 30, followed by the surrender of the Three Sons, the student leaders knew it was just a matter of time before the occupation phase of Hong Kong’s pro-democracy movement was over. By December 4, HKFS was holding discussions on whether to stay until Admiralty was cleared or whether to retreat before they were forced out, and on possible future steps to bring the movement beyond just the physical occupation sites. Two more individuals, Gloria Cheng Yik-lam and Eddie Ng Man-hin, also joined the hunger strike that day, bringing the total number of strikers to five. It seemed that the hunger strike was Scholarism’s last efforts to force the government to accede to the students’ demand for discussion, but as I previously mentioned, it didn’t really have HKFS’s full, enthusiastic support. But tons of people involved in the movement gave the hunger strikers love. Certainly part of it was the way that Scholarism framed itself as a youth organization. It had grown from the 2012 action against National Education, as I’ve mentioned before, as a secondary school students’ organization. Although Joshua Wong is now a university student, along with several of the hunger strikers, Wong is known for being just 18 years old. Their spokesperson, Agnes Chow, has a very youthful appearance and, within a few weeks of the movement’s start, stepped down due to exhaustion (see her letter of resignation from October 10, in Chinese, here). The hunger strikers themselves were immediately besieged with physical problems that made them seem similarly frail – one of the girls vomited within a day or two of beginning the strike, and Wong had to take glucose formulas a few times to prevent his blood sugar level from dropping too low. Wong also wrote an open letter to his mother at the 90th hour of his hunger strike, which was posted online and physically at Admiralty. Scholarism frames itself as the sons and daughters of Hong Kong, and this notion – “to protect the students” – is what motivated (continues to motivate) many protesters. And so on the night of December 5, dozens of people gathered outside the tents where the hunger strikers were resting to stay with them through the night, hosting a “靜坐讀書撐學生 Silent Night, Reading Night, Love & Peace, Be with Hunger Strike” event to offer the hunger strikers silent companionship. That morning, three members of the Liberal Party, a pro-Beijing group, visited the hunger strikers and pledged to try to arrange a meeting between CY Leung and the students. Joshua Wong, meanwhile, criticized CY Leung for ignoring the students, noting that when Scholarism had held a hunger strike during the campaign against National Education, Leung and Carrie Lam had visited them on the second day. It was sort of a failure of Leung’s fatherly duties, as a leader of Hong Kong and a father in his own right (though people certainly don’t think much of his parenting skills anyway, considering his daughter’s personal struggles). That night one of the hunger strikers, Isabella Lo Yin-wai, had to start eating again; another hunger striker, Prince Wong Ji-yuet, was sent to the hospital the next afternoon. Then, after 108 hours, Joshua Wong and two others also gave up their hunger strikes. Here’s a video of Wong explaining on the Big Stage why they decided to end the hunger strike. It seemed to have made very little effect on the government or the path of the movement. Government officials announced their plan to start the second round of consultation on political reform after the protest sites were cleared. Here are my (rather cynical) thoughts on the hunger strike. I don’t mean to disparage the pain and efforts that the Scholarism hunger strikers suffered – goodness knows I would never last, considering how my flatmates already joke at my frequent midnight snacks – but I’m not very surprised that they were ineffective. People around the world applauded Hong Kong people for engaging in one of the most peaceful mass demonstrations ever seen. 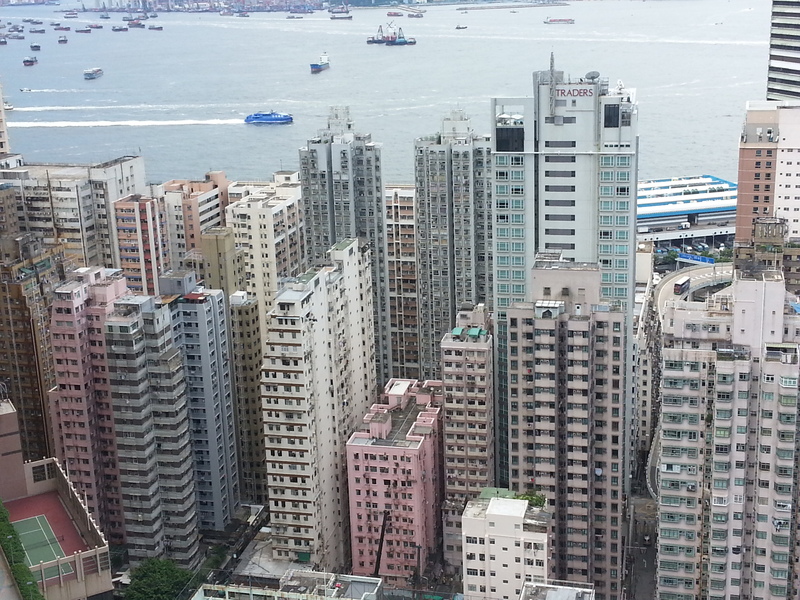 Considering that many Hong Kong people are recent immigrants from mainland China, or have family in the mainland, the memories of serious violence and heart-rending pain echoing across generations – these are definitely factors reminding activists of the need to remain peaceful, and no one wants to see real harm done to anyone. And, time and time again, it’s been shown that in Hong Kong, violence destroys support for a cause. In 1967, two children died from the explosion of a bomb planted by leftists, who were influenced by the Chinese Cultural Revolution. In 2000, during the struggle over the right of abode for mainland-born children of Hong Kong residents, the Immigration Tower in Wanchai suffered an arson attack. Many people who didn’t support the Umbrella Movement say they still want democracy and they still identify as pro-democratic, but they just didn’t support the method. They argue that the street occupation was too aggressive and affected other people’s livelihoods. On December 5, a High Court judge refused to hear an appeal against the injunction order on Admiralty, which – although it didn’t set a schedule for clearance – meant that it was only a matter of time. Although the injunction only covered about a fifth of the total occupied area in Admiralty, HKFS was reported to be considering withdrawal, the implication being that they would retreat of their own accord, without being forced by the bailiffs and police. Funnily enough, there’s still quite a bit of discrepancy about the real economic impact of the protests. SCMP reported that All China Express, the bus company that filed the injunction, claimed it saw a 17% drop in ticket sales since September 28 because the route between Wanchai and the mainland was affected. It’s commonly thought that small businesses, taxi drivers, and bus drivers were most seriously affected by the protests, but there have been several stories of taxi drivers (and bus drivers, like this one I mentioned in early December) claiming that their income actually increased during the protests. Hong Kong blogger Jason Y. Ng wrote about his encounter with a taxi driver on December 19, sharing his story about how his earnings had actually gone up during the protests. How? For 79 days, I worked less and made more. Who doesn’t like that? […] Traffic was way better during the protests. There were no double-deckers taking up multiple lanes, and more people took taxis because buses and mini-buses were re-routed. […] On average, I made about $300 more every day. In fact, even business and tourism were reported to have improved during the protests – despite claims to the opposite. On October 10, while the protests were still going strong, the Financial Times cited the Hong Kong Tourism Board stating that the number of visitors increased during “Golden Week” by 4.8% from last year’s numbers. Though there was a slight fall due to the protests, SCMP also reported that the year’s tourist numbers increased 12% from the previous year in total. Foreign Policy has also put together several graphs on the stock market, retail sales, and tourism to show that there hasn’t been much economic damage due to the protests. On Monday, December 8, we heard the news that more than 3,000 officers were to be on hand for the clearance of Admiralty and Causeway Bay the coming Thursday, December 11. Details were still to be finalized that day. The next day, protesters were given a deadline of 9am to evacuate the area. 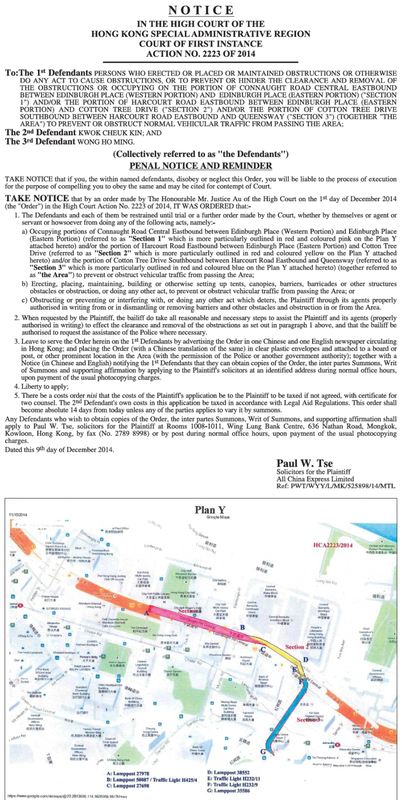 To the right is an image of the court notice and a map of the areas to be cleared. SCMP also reported that every night, already over a thousand officers were in Mong Kok to prevent “shoppers” from trying to reoccupy the protest sites at Mong Kok. A few sites have done great features on the 9wu phenomenon, and this SCMP report does a good job as well. Scuffles usually break out when the tour reaches its last stop on Tung Choi Street, where minibuses operated by Chiu Luen Public Light Bus Company pick up passengers. The company was one of two applicants for the injunction orders which allowed last week’s clearance. […] we have not seen true madness and violence in our peaceful city of Hong Kong until this day, demonstrated by police officers who were raging with profanities and were desperate to erupt their violence towards the healthcare volunteers. For a long time, we tried our best to rescue and safeguard the health of the people of Hong Kong. Further more, during the incident, we were rational enough to attend a wounded police officer; yet we were irrationally attacked by his comrades. These are not acts of sanity and the police officers lost their sense and control. It is equally terrifying to realise that this is the behaviour of the professionals whose jobs are to guard our law and social order. But as I said in reference to the hunger strikers… 9wu-ers don’t have the same kind of emotional power and moral authority that the student leaders do. Despite the danger and violence they’re facing, they just don’t have the public’s sympathy. That is – assuming they want, or care for, public sympathy. The schedule for December 11 was set. As I understood it, the bailiffs would make announcements and warnings starting at 9am, and the police would seal off the entire site by either 10:30am or 11am; anyone leaving the site after that time would have their personal details recorded, or they would be arrested if they stayed to block the police and bailiffs’ progress. I’m not entirely clear on whether name-taking is legal, but as an intimidation tactic it certainly had an effect… I myself determined to leave before the area was sealed off by the police. Some people began to pack their belongings and tents to leave; the Umbrella Tent census saw the first dip in numbers since counting began. But not everyone was getting nervous the day before the clearance. 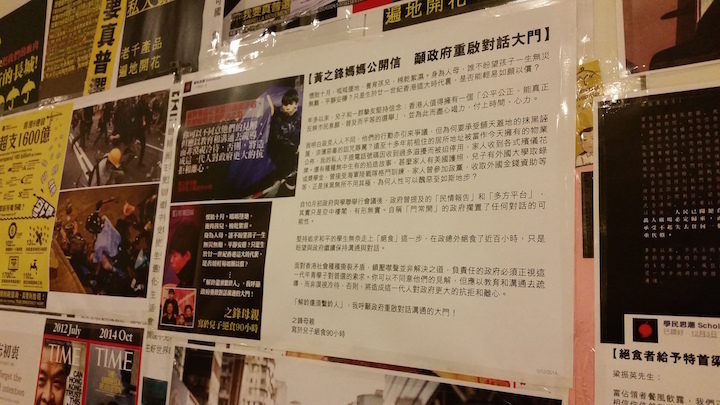 HKFS pledged there would be no resistance, and planning to just have a peaceful sit-in. But apparently there was a new group called Student Front that warned it might put up resistance (according to Reuters, it was founded on December 6). Freelance journalist Ellie Ng’s got a great analysis at Foreign Policy on reactions to the clearance of Admiralty, and she refers to Student Front. She argues, and I agree with her, that the occupation at Admiralty and the shopping at Mong Kok reflect different opinions toward the methods of protest – similar to the divide in the pro-democracy camp over the “left plastics” and the radicals. I haven’t written about the left plastics yet – it’s a fascinating subject – and I’ll have a more extensive post about it later. But for now, basically, the left plastics are those traditional pro-democracy leaders (the Democratic Party, etc) and the general Hong Kong populace that participates in annual pro-democracy marches and rallies. Radical pro-democratic groups like Civic Passion criticize the left plastics for using peaceful methods that, they argue, have not achieved anything. Some argue that the left plastics are not, in fact, really pro-democratic, but merely performing the pro-democratic stance while reaping benefits (political, economic, perhaps moral/emotional) for themselves. So Ng argues that as the end of the occupation arrived, some protesters – especially those whose protest base had been in Mong Kok, and those who continue that spirit through 9wu – did not actually care about the clearance of Admiralty. She quotes one Mong Kok protester saying, “We didn’t go (to Admiralty) because arrests are meaningless sacrifices.” The Student Front was a group that wanted to make a stand at Admiralty, rather than simply sit peacefully and wait to be arrested. I’ll write about the eve and the day of the actual clearance later, as it’s already pretty late today… putting together a post takes quite some time, sifting through news stories, tweets, videos, and so on – every piece leads to another interesting question or aspect to write about. Dec 4 – Coconuts HK did another story on Jeffrey Andrews, one of Hong Kong’s first locally trained ethnic minority social workers. Dec 8 – Not to get completely caught up in the Umbrella Movement – the trial of Erwiana’s employer began in early December. Erwiana Sulistyaningsih is a foreign domestic worker from Indonesia, whose employer is accused of beating her, physically abusing her, starving her, and many other abuses. It’s really horrible stuff, and following the arguments being thrown back and forth by the employer and her family is just disgusting. For instance, the defense suggested that Erwiana’s scars were caused by acne, not by being beaten or anything. This reminds me of a great book on Hong Kong’s environmental protection/preservation movement that offers an incredible analysis of social movements in postcolonial Hong Kong in general through the term “anticipatory nostalgia” – Tim Choy, Ecologies of Comparison: An Ethnography of Endangerment in Hong Kong (Durham: Duke University Press, 2011). *Albert H.Y. Chen, “Social Movements and the Law in Post-Colonial Hong Kong,” in Social Movements in China and Hong Kong: The Expansion of Protest Space, eds. Khun Eng Kuah-Pearce and Gilles Guiheux (Amsterdam: Amsterdam University Press, 2009), 84.